Marble, travertine, and limestone floors are often damaged through wear and tear from daily traffic, or acidic liquids such as vinegar or household cleaners. Fortunately, we regularly save our clients tens of thousands of dollars by restoring marble floors, rather than replacing them. Here are the steps that we follow. 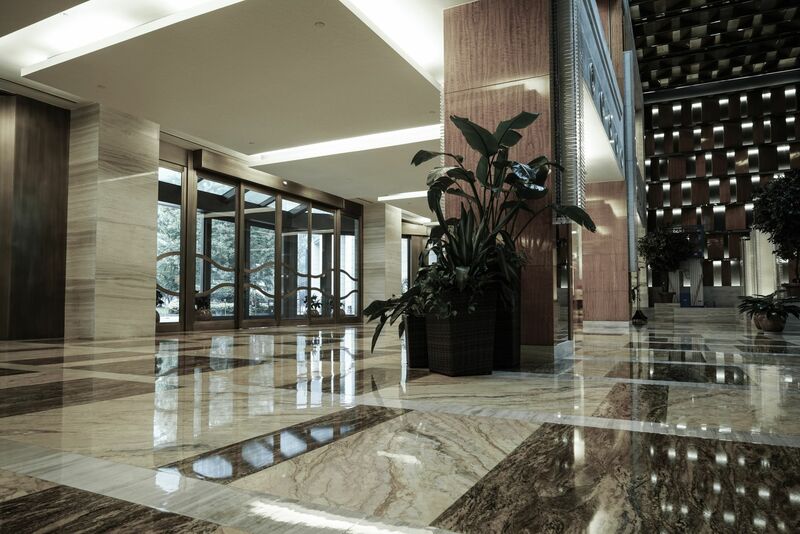 We start the marble tile cleaning process by doing a thorough alkaline or neutral scrub and steam cleaning. Then, we move onto a multi-step diamond polishing. Our stone polishing process starts with a heavy grit diamond polish pad, and then moves to finer and finer grits. This ensures that we diamond polish away the initial damage, and then end with a satin or glossy finish, depending on your preference (we offer 6 levels of gloss for you to choose from). After each marble polishing, we use a spinner tool to prepare the stone for the next step. This specialized machine allows us to rinse the floor with boiling water, while simultaneously vacuuming up the water, soil, and dust from the floor in a self-contained environment. This allows us to clean your marble tile floors much more thoroughly than mopping alone. This is essential in order to fully remove the marble grit between steps, and allow us to achieve the best possible finish. Our marble sealer will leave your tiles with a beautiful shine. After the final step is complete, we then apply 2 coats of premium stone sealer. We use an enhancing impregnating sealer; this means that the sealer seeps deep into your natural stone, rather than a topical sealer, which sits on the surface of the stone. This means that the coating will not peel off. This also means that if your marble tile floor becomes scratched again, it is not usually necessary to go through the entire stone polishing process. We also offer broken floor tile replacement, if one of your marble tiles has come loose. Or, if your marble tile is chipped or broken into pieces, we also offer natural stone repair. Get the shine back in your marble floors.